Well, it’s been awhile since we have posted anything. Our perpetual home improvement projects and getting ready for the holidays have kept us really busy over the past month or two. We had a wonderful Christmas Eve at Rob’s parents in Warwick, RI where we were served the traditional Italian meal highlighted by the Seven Fishes (the main course was lobster tails which were yummy)! Then on Christmas Day, we hosted the family Christmas dinner at our house in Norton. So for the last few weeks, I’ve been decorating, slicing, dicing, stirring, baking, cooking and cleaning. Lot of work but lots of fun too! It was worth all the effort though since everything turned out delicious (at least according to the family) with no major disasters! Now that we are past the holidays – well almost, we still have New Year’s to celebrate – we can turn our attention to getting the bus ready to hit the road. Our initial plan for heading south was to leave on Sunday, December 30th, spending New Year’s Eve on the road, but we recently learned that Rob’s mother has to have surgery which is scheduled for January 17th. It’s not major surgery but she will most likely have to spend one or two nights in the hospital. Although both Rob’s parents insisted that we not change our plans, neither Rob nor I felt comfortable with being hundreds of miles away and no one there to support either of them during this stressful event. Long distance worrying isn’t any fun! So we decided to delay our departure until after her surgery, and rescheduled our departure to January 20th, provided everything goes well which we’re sure it will. This way we can drive them to her pre-op appointment on January 2nd and to the hospital on the 17th (which is in downtown Providence) and be there for moral support on the day of the surgery. Also, after her discharge we can provide additional assistance and a ride home. This actually works out well for us since we have been so busy with our house projects and getting ready for the holidays that we haven’t started prepping or loading up the motor home. Trying to take down all the Christmas decorations and get everything else ready and done before Sunday would have been a very stressful fire drill. Having the first few weeks in January to prep for the trip will be a lot more relaxing. Maybe with so much time, we won’t forget anything! HA, not likely! Even with the delay, our plans haven’t changed much – we did cancel a reservation we had at Myrtle Beach the first week in January, changed our reservation for a minor service appointment at Freightliner in Gaffney, NC and modified our reservation at Ft. Wilderness which had to be delayed by three days. The only other reservation we’ve made so far is in March in Gulf Shores, AL and hopefully that will just remain the same. So no big deal! If you have paid attention to the national weather, you might think that we were buried under snow here on Christmas day. The good news is that we were not. 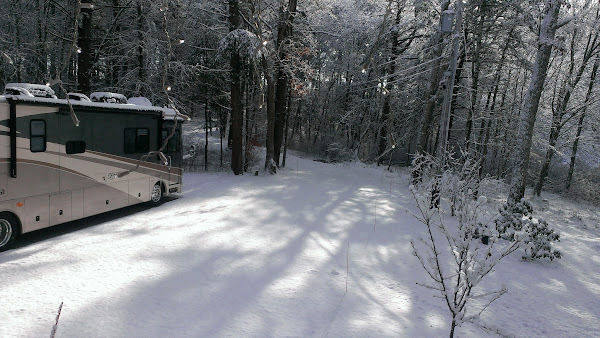 Being located in the Southeastern portion of Massachusetts and fairly close to the ocean, we had more rain than snow that day. On Christmas Eve & Christmas Day, enough snow fell to coat our grass so I guess we could say we sort of had a white Christmas. It is pretty when it’s fresh and changes the landscape – I suppose someday we will miss that aspect of it! Another storm hit NE on Thursday which dumped lots of snow on the western part of the state and in NH and VT – the ski areas are lovin’ it! Nothing much here though. However, Saturday night was a different story, we were right at the center of the bullseye for maximum accumulation. 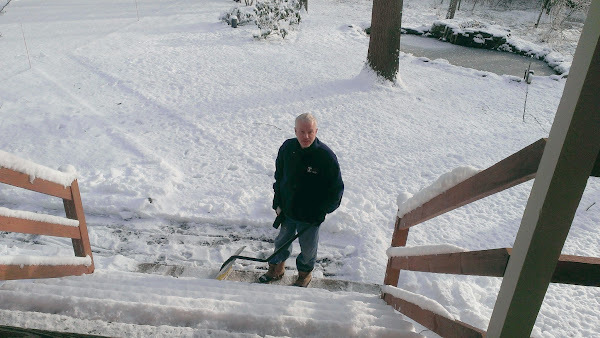 Rob got the plow ready just in case Saturday afternoon. All afternoon and all night the snow came down, pretty heavy at times. Ironically, on the local 11 p.m.weather, the meteorologist was talking about the strong, gusty winds and the fact that the area could experience power outages. No sooner had those words come out of his mouth when our power went out. Drats! So we scrambled for our flashlights and trundled off to bed, hoping that our power would be restored quickly. Otherwise Rob would need to get the generator operating in the morning. Luckily the power was restored about 7 a.m and despite the power being out for 8 hours and having no heat with sub freezing temperatures outside, the inside temp never went below 61°F. Looking out the window the next morning, it appeared as if we got about 5″ which was on the lighter side of the 5″ – 8″ they were forecasting for our area. Whew! Now the question in the morning was – to plow or not to plow? Do you leave it as is so it becomes an icy frozen tundra which could become nasty if we have another storm? Or do you plow and end up with impenetrable icy frozen mounds of snow surrounding the driveway? Well, after some deliberation, the final decision was to plow! The snow itself isn’t so bad, it’s mainly an issue of what to do with it. 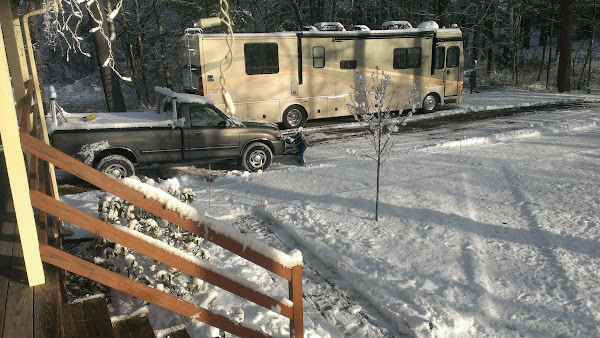 Egress from our driveway out on to a quarter mile worth of one lane, twisty, pothole filled dirt road is very tight in the coach even in perfect weather – adding piles of snow and ice on either side makes it much more difficult. A real heavy storm or a succession of smaller ones could even prevent us from getting out at all (as almost happened in 2011). We’re keeping our fingers crossed that this recent accumulation will melt a bit and that the snow gods will stay away for the next 3 weeks so when the 20th rolls around, we’ll be able to leave as scheduled. May all of you have a safe, healthy and Happy New Year! Our best wishes for Rob’s mother. Your blog was very interesting. We had 1/2″ snow this morning and a few flurries now. Being here in SE Arizona it was a nice surprise. 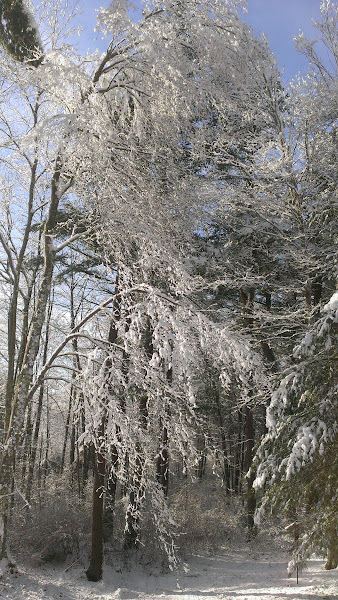 The picture of snow on your trees would make a nice Christmas card. I loved your Christmas decorations. They are beautiful. The classy dining room table looked very inviting. I know having family and friends over was nice for both of you. Jim and I wish you a safe trip when you leave around Jan. 20th. Happy New Year from sunny Arizona.